This is Jonny C. and Sam Riot. They are best friends and welders here in Austin, TX. Jonny got his knuckles done first and say they are a reminder of what life is for him. His knuckle tattoos were the first tattoos he got and now he is fill his arms on up. 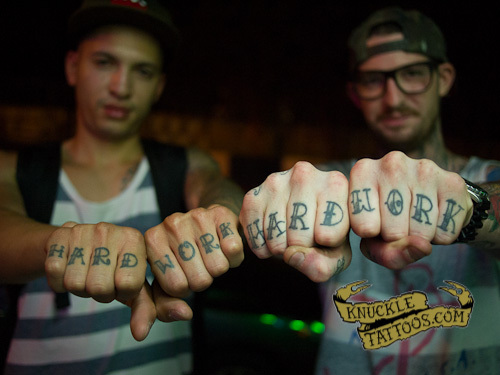 Sam loved the idea of HARD WORK and asked Jonny if he minded getting matching knuckles. Jonny was on board, and now the two are working class heroes until they die.